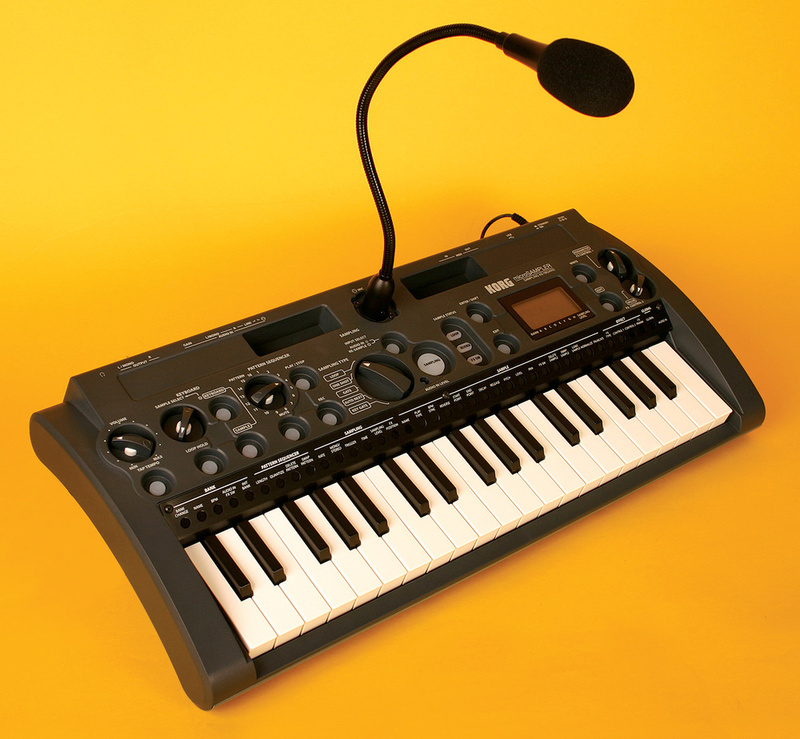 The phenomenally successful Microkorg brought simple, affordable synthesis to the masses. Can Korg's Microsampler do the same thing for sampling? With the appearance of software samplers, the writing was on the wall for their once unassailable hardware counterparts. Massive sample libraries and DAW integration proved to be body blows to the impassive, rack‑mounted dinosaurs. If the hardware sampler was to have a chance of keeping a place in the computer‑based studio, it was clearly time for a rethink. No slouches in the thinking department, Korg's boffins have given the sampler a makeover, the result of which is a lightweight keyboard. The Microsampler is small enough to throw into a rucksack, simple to operate, and has absolutely no quarrel with the monsters that lurk beneath your desktop. By returning to the essence of what samplers once were, the Microsampler aims to be as relevant as ever, perhaps even more so. The Microsampler's curvy, grey plastic body is cratered with recessed knobs and spongy buttons. It may be that sunken controls are less prone to accidental contact than the more common sticky‑up type, but I suspect it'll be dust and fluff fetishists who reap the biggest rewards. The chosen knobs feel fractionally sturdier than those of the other recent 'micro', the Microkorg XL, with the added bonus that you can easily tell what they are pointing at. On either side of the central microphone socket, two deeper recesses serve as parking bays for iPods and iPhones. Or, for the less up to date among us, mint imperials, glowsticks, audio adaptors, toothpicks — and more fluff. Weighing in at less than 2kg and ideally sized for laptop partnering, the Microsampler is a world away from the bulky, rackmounted beasts of yore. Flipping it around, we find a rear panel entirely lacking in surprises. There are stereo inputs and outputs, a headphone jack, MIDI In and Out sockets (no Thru) and a USB port for transfer of data. Power is dispensed via a 9V adaptor (which is supplied) or from six AA batteries (which are not). The manual estimates four hours of use on battery power, which could be sufficient for a gig — or an afternoon in the park. A splendid gooseneck microphone is included in the package ,so you can start making burp and fart recordings instantly. A gain adjustment control offers enough sensitivity for typical audio sources, and a rear‑mounted switch selects either line or mic operation. Like Tom Cruise, this switch is rather under‑sized for something destined to see a lot of action. Also on the small side is the amber backlit screen, although Korg keep it uncluttered and effective in operation. The review model arrived with a power saving time‑out engaged, presumably to optimise battery operation. Naturally, this can be overridden so that the display stays lit all the time. Regular readers may recall that I wasn't particularly enamoured of the 37‑note mini keyboard of Korg's Microkorg XL. For the purpose of triggering samples and loops, however, I have no complaints of this one. In fact, I applaud the decision to give the Microsampler a keyboard in preference to, say, velocity‑sensitive pads. For one thing, you can fit more of them within a tiny footprint, meaning instant access to more samples. The keyboard is velocity‑sensitive but lacks aftertouch. Indeed, hammering home the message that the keyboard is primarily for triggering samples (and not a synthesizer), there are no performance wheels and no transpose keys. There are LEDs, though — and in abundance, one over every key. These glow red for each sample that plays, whether triggered from keyboard input or from the built‑in pattern sequencer. The resulting light‑show is a honey trap for electronic musicians everywhere. No surprises on the back panel: From left to right we have a USB port, MIDI In and Out, stereo audio inputs with mic/line switch and gain control, stereo audio outputs and a headphone socket. For the speediest navigation this side of the Starship Enterprise, separate Menu entry points are provided, labelled on a metal strip that spans the full three octaves of the keyboard. By holding down the Edit button and a key corresponding to the desired page, you're whisked right there. Alternatively, press Edit, then use the knob labelled 'Parameter' to hurtle around. As there are dozens of pages, you'd be a bit crazy to prefer this method exclusively — but since some pages don't have direct entry points (the many effects parameters, for example), some craziness is enforced. There aren't anywhere near enough keys to accommodate all the pages, and if there were, Korg would have to drop the 'micro' prefix. Regardless of how you navigate, values are tweaked by the Value knob. The Parameter and Value knobs, it should be said, are far from the ultimate precision-editing tools; often their small area of travel is frustratingly limited for the job at hand. There are five sampling modes: Loop, One Shot, Gate, Auto Next and Key Gate. Loop and One Shot are pretty self‑explanatory, the only disappointment being that loop recording doesn't automatically initiate playback when it ends. Maybe I'm spoilt by Korg's other nifty loop‑grabber, the Kaoss Pad 3. Gate sampling is similar to One Shot, with the exception that you only hear the full length of the sample if you hold down the key for the entire duration. 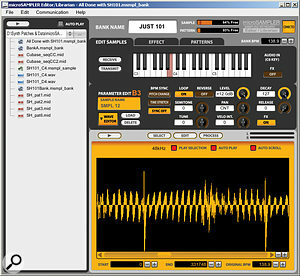 Auto Next is designed to record a stream of samples to a succession of keys. It's particularly neat for capturing individual sections of a loop (in slices of between a 64th note and eight bars), to be dynamically reconstructed later. Annoyingly, once you have 'Auto Nexted' through all the assigned keys, sampling loops back to the start and begins overwriting the sample made on the first pass. Hopefully this 'feature' will be changed in a future update! A workaround is to allocate extra samples at the end of the Auto Next chain (assuming some keys are free), and interrupt, then delete them before the good stuff gets binned. During Auto Next recording, the LEDs above the keys flash — although, distractingly, at a fixed rate rather than the current tempo. Key Gate is like a manual version of Auto Next, designed to let you control the lengths of individual samples according to how long you hold each key. It offers the neatest way to sample scales such as 'do‑re‑mi‑fa‑so‑la‑ti‑do' that I've yet encountered, automatically assigning each note and length as you execute your finest Julie Andrews impression. Sampling may be performed in seconds or clock divisions of the current tempo. The latter is for creating loops, although, with no 'beat detect' function, the Microsampler can't guess the bpm of incoming audio by itself. Therefore, you must first set the tempo using the tap tempo button. Sampling is initiated either by an audio threshold being exceeded, by pressing a key on the keyboard or by pressing the large 'Sampling' button. While this is a useful set of options, I would also have liked a pre‑sampling count in, or even some way to initiate sampling by hitting 'run' on a sync'ed drum machine. Korg have made the sampling process compellingly straightforward. Having set the sampling method, rate and time and checked the input level, the only consideration left is whether to sample from the line inputs or the microphone. Or whether to resample. Ah, resampling! Selected by an innocent prod of the Input Selector button, this is where even your most pathetic grunts and whistles can be woven into audio gold. We haven't yet examined the Microsampler's effects or pattern sequencer but be assured, resampling is your road to delightfully complex and unique results. Using many components at once — tunes and rhythms from the sequencer, live keyboard noodles, gated audio input and as many elements routed through the effects processor as you like — it simply abounds with creative possibilities. The Microsampler's front-panel controls are very clearly laid out — although there's perhaps a whiff of the dashboard design of an early‑'90s Vauxhall! Having captured some samples, there is a short but pertinent list of actions you might take. Each sample may be looped, reversed or routed through the current effect. Delve into edit menus and you can do a little more, including normalisation, change of pitch, naming the sample, trimming its start and end points, setting the level and pan or tweaking decay and release times. The envelope times are cleverly scaled so that setting release at maximum will always play the sample in full. It's a pity there's no way to vary a sample's attack time, though. For slow-attack material you'll either have to record it that way or reverse it afterwards. As I said earlier, this isn't a synthesizer, so there isn't much performance control over your samples, other than to specify how much each one's level is responsive to incoming velocity. The Loop Hold button can be used to keep loops playing forever — alongside others too, up to the available polyphony limits. Polyphony is nominally 14 notes, dropping to half of this figure if your loops are time‑stretched. Yes, time‑stretching is included, and while it won't consign Ableton Live to the scrap heap, it does handle the vital job of letting loops created at different tempi fit snugly together. To conserve polyphony, it's often better to sample at the tempo you really want anyway, but thanks to time‑stretching you can always resample at a new tempo later. Although the Microsampler isn't primarily intended for polyphonic keyboard parts, you can choose one sample to be played that way, across the keyboard's three octaves. Frankly, it would have been daft to include a keyboard and not allow this! Press the 'Keyboard' button, turn the Sample Select knob and you're ready to play. The keyboard part can be addressed via a separate MIDI channel and responds to incoming pitch‑bend information, plus volume and pan, but that's your lot. Up to 16 patterns are stored in each of eight sequencer banks. Patterns are restricted to 4/4 and may be up to 99 bars long, with up to 16,000 notes, and a maximum capacity of 64,000 notes per bank. Pattern recording is, like sampling, stripped to the essentials. First, you decide how many bars you need, then set the count‑in time and whether your performance is to be quantised. Unfortunately, the metronome has a fixed tone and volume, which I found grating. When recording, patterns loop in permanent overdub mode. So all you need to do is select either keyboard or sample mode, then tinkle the ivories. By adjusting the quantise value prior to each pass, you can mix tightly sequenced material with unquantised keyboard sloppiness (the sequencer's resolution is a respectable 480ppqn). However, there is just one level of undo provided, so if you make a mistake, undo will wipe the entire pattern. On the plus side, you can delete individual notes after recording, which slows you down, but only slightly. Having recorded a pattern of sample hits, loops and keyboard extravaganzas, you can use the Mute button to mute the playback of individual samples — or individual notes in the keyboard part. This latter function is excellent. I'll try to explain. First, imagine overdubbing a highly complex polyphonic sequence. Then mute most of the notes involved, leaving a sparse pattern running. Finally you create a performance by selecting individual notes to bring in and out interactively. To further boost performance potential, mutes are maintained over pattern changes. Oh, and during Pattern playback, you can specify whether a new pattern should kick in at the end of the current bar or the end of the entire pattern. There isn't a lot more to the sequencer — but don't mistake lack of bells and whistles for naffness. The main limitation is probably its lone keyboard/melodic part — even one more would have made a big difference. Still, the sequencer will sync to external MIDI clock, meaning that the harvesting of loops from drum machines and so on is very straightforward. And even if you find what appears to be a serious omission (such as when I looked in vain for a Pattern Copy function), you often find a workaround (in this case to first write the pattern to be copied, then switch to a new location and load in the previous one). And if you don't find a workaround, there's always Korg's free software, discussed in the 'Software' box. The single effects processor offers 21 algorithms, arguably a superior selection to those of the Micokorg XL, not least because reverb makes an appearance. With a maximum time of 10 seconds, it's not a bad reverb, either, whether for sampling drums or eerie transposed lemur calls (I happened to have the Microsampler close by during Last Chance To See). Similarly, there's a goodly selection of delays, a pitch‑shifter, a 'talking modulator', a resonant multi‑mode filter, an equaliser and a compressor. Factor in a four‑band EQ, distortion, phaser, chorus, flanger and other popular effects from the Kaoss Pad series and you've got plenty of ways to really muck things up. One effect at once might seem stingy, but I feel that packing in more would have pushed the Microsampler beyond the edge of the fun zone. Performance controls are thin on the ground but the two Parameter edit knobs also double up as FX Control knobs, assignable to key effect parameters. Select a filter effect and the knobs can control cutoff and resonance, for example. Interestingly, the movements of these knobs are not recorded into the pattern sequencer, but if the appropriate Continuous Controllers are found in an imported MIDI File, they respond correctly. Finally, one effect that deserves special mention is the looper. It's always good to have any kind of audio looper, and this one adds some functionality overlooked by the existing sampling modes, specifically overdubbing. The looper isn't as supremely easy to use as the rest of the Microsampler, though. It requires the two FX Control knobs, which, as I've already stated, aren't very precise. Here, buttons to engage record, playback and overdub were vitally needed, and a metronome should really have been provided. Its best tricks involve playing back loops at frenetic high speed, reversing their output, or dynamically slicing them into chunks as small as a 32nd of a beat. Freaky! I get a warm feeling whenever I rediscover something I thought was lost. The Microsampler harkens back to when sampling was novel and exciting; when it was all about finding an interesting sound and using it. Somehow, this simplicity got lost. So is it beautifully recaptured here? I think it is — and without all that pratting about with quick disks, floppies or noisy internal drives. The Microsampler boots speedily, primed with the last bank you were working on. How I wished for just that simple thing when I owned the far more sophisticated, yet ultimately teeth‑grinding Yamaha A5000! I don't have too many complaints, and those I've mentioned aren't in the same league as the things I like. If you're a human beatbox, you're going to love the Microsampler. Ditto for musicians sat in hotel rooms whistling tunes, others wanting a portable package of computer‑less loops, or anyone seeking a catalyst for fresh ideas. Portability is a great bonus (heck, I'd have liked speakers too), and it's great to have a Microsampler around for whenever inspiration strikes. While not priced as an impulse buy, this tiny keyboard could fill a niche for most of us, I suspect. Its strength is in merely being a sampler — a fast, no‑nonsense recorder of stuff. Stuff you have to find. It's a rare concept these days: a piece of kit that tries to stimulate your grey matter. Who knows, it could even lead to spontaneous outbreaks of originality! The Microsampler doesn't have much direct competition: the closest equivalents are based around pads, rather than around a keyboard with a cute microphone. Of these, Akai's cheapest MPC, the MPC500, can run on batteries and has a sophisticated sequencer and 32‑voice polyphonic sampler. Roland's SP555 is also impressive, having more instantly accessible samples, very good effects and expandable memory (via compact flash cards). Also look out for the SP404X (soon to replace the SP404) which is cheaper still. Having said all this, I should stress that none of the competitors quite has the back‑to‑basics clarity of purpose of the Microsampler. The Microsampler holds eight banks (A-H) of user samples and a single ROM bank. As demos go, the ROM bank is a Korg rarity — completely uninspiring — and so, like an embarrassing elderly relative, we'll avoid it entirely. So what do these eight empty banks offer to tempt the eager would‑be samplist? Each bank can hold up to 160 seconds of non‑volatile material divided into a maximum of 36 samples. This amount is based on mono sampling at 48kHz, and you are free to choose lower rates of 24, 12 or even 6kHz to obtain more time. Choosing the lowest rate earns you 21 minutes of crunchy, grainy samples per bank and you can freely mix mono and stereo samples at different rates across the keyboard. Surprisingly, even samples recorded at 6kHz produce interesting results and you can monitor how each rate will colour the sound before you commit to sampling. If, like me, you find extra seconds more precious than crystal clear fidelity, you will probably enjoy the eminently useable 24kHz rate. Of course, it would have been great if the overall sample space (which adds up to about 21 minutes at the top rate) had been contiguously available rather than being divided into banks — especially as swapping banks takes a number of seconds. But it's not earth‑shattering, as cons go. Similarly, there's little point in agonising over Korg's choice of the DAT sample rate of 48kHz instead of the more common 44.1kHz. It isn't much hassle to convert if necessary and if you wish to import existing CD-quality samples, Korg provide software that will happily oblige. As samples are allocated to keys on the keyboard, you might have been wondering why each bank can hold only 36 of them. This is because the topmost key is used to gate incoming audio — either as a stuttering‑type effect or for convenient monitoring purposes. You decide whether incoming audio is passed through the onboard effect processor, or not. After a few creative outbursts, you're probably going to want to offload the nuggets you've been gathering, perhaps for more mouse‑intensive development. Given that there is no card slot, it's fortunate that data extraction to a PC or Mac is fast and painless. 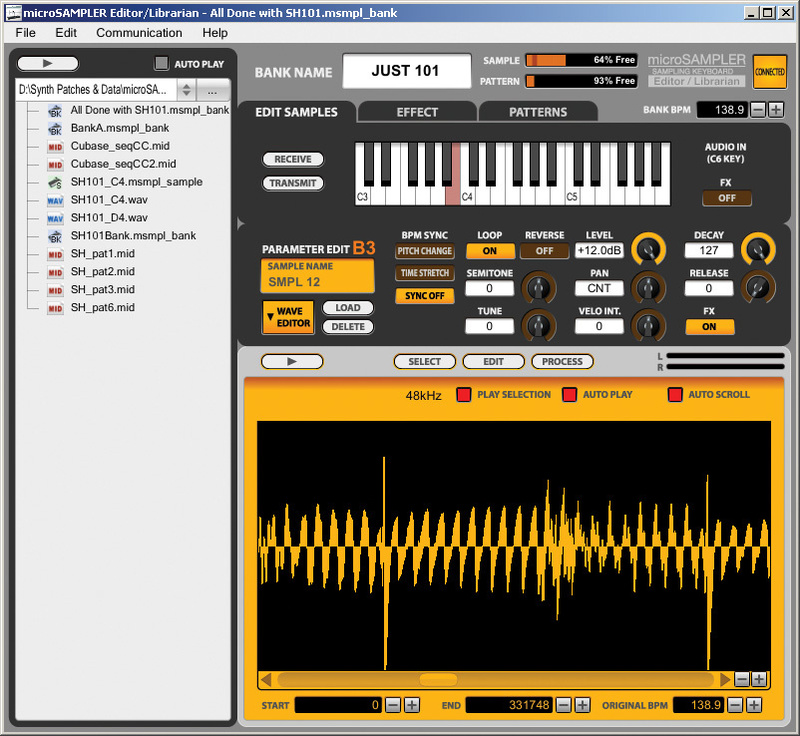 First, a visit to Korg's web site is needed to grab the latest USB driver, plus the version of the Microsampler Editor appropriate to your computer. I doubt that installation and comprehension of it will tax SOS readers. The Editor's three main work tabs are exactly the three you need: 'Edit Samples', 'Effect' and 'Patterns'. Without any whiff of complication, you can import samples and transmit them to the Microsampler, or export those you've created as WAV or AIFF files. Oddly, the export operation doesn't offer to convert to 44.1kHz for you. Naturally, you can back up entire sample banks for archiving or compile new banks from your best samples — something I found laborious on the Microsampler itself. Being able to import and export patterns as Standard MIDI Files (SMF) is particularly useful too, to refine sketches begun on the onboard sequencer. Here, pattern copy becomes easy and, speaking of easy, the joy of adjusting FX parameters from a screen capable of showing them all at once cannot be overstated. Sampling (and resampling) made fun again! A source of original loops, a musical sketch pad, a portable backing machine... You decide! Available memory is split into banks rather than contiguous. Minor gripes: the Parameter and Value knobs aren't suited to all tasks and the metronome is rather loud. Sequencer supports only one keyboard part. A portable, keyboard‑based sampler ideal for jotting down musical ideas or for generating home‑made loops and samples for further development. Simplicity is its strength but it also means the responsibility is on you to come up with the goods, which is healthy if a little scary.